Today we are taking a look at the Martin D-16GT, which has made a name for itself with guitarists looking for a new six-string partner in the under $1,500 market. This American-made dreadnought is part of the iconic brand’s 16 Series, which is known for taking models from the premium Standard Series and making them a little more affordable. Sounds good to us so far! You don’t need to take more than a quick glance at the D-16GT to recognize it as a Martin, with that classic dreadnought shape and an air of understated elegance. Diving deeper into this handsome guitar, we find that the body is exceptionally crafted from solid Sitka spruce on the top, while the back and sides are made with solid mahogany. Unlike some of the higher-end Martins, the D-16GT features simple detailing, such as the polished gloss finish on the top, the striped herringbone rosette, and black Boltaron binding around the body. The neck on this one is interesting. It features a ‘select hardwood’ build, which some say is mahogany, some Spanish cedar. Either way, it has a lovely feel in the hands with a low oval profile and satin finish. However, the main interest lies in the fretboard, which is made of Richlite – an FSC-Certified material made from compressed paper. In the current market, Martin is one of the leaders in using environmentally-sustainable materials in their guitars and some of their higher-end models are no exception. Some more traditional players may scoff, yet Richlite is an excellent material and is becoming the standard for Martins. It’s as dark as ebony, incredibly hard and durable, and very slick, making it an excellent choice. On this fretboard there are a total of 20 frets (14 in the clear) with simple dot inlays. The hardware won’t blow anybody away, yet it’s appropriate for the price range. There are no electronics to talk of, so attention turns to things like the tuners and bridge. These Martin-branded tuners are made of chrome and are closed-gear with a smooth, precise operation. The bridge is also made from Richlite and features a compensated White Tusq saddle (the nut is White Corian). Finally, the D-16GT comes shipped with a very nice Martin 345 hardshell case, for excellent protection whether in storage or traveling from gig to gig. Moving onto sound and, boy, is this impressive! The first thing you notice when strumming the D-16GT is the booming low-end it delivers. However, despite such emphasized bass, it remains warm and articulate throughout, and doesn’t overpower the mids or trebles. In fact, with the traditional combination of spruce and mahogany, it’s tonally very well balanced. This guitar features the bold projection you would expect from a Martin dreadnought, so even unplugged it’s pretty loud. Overall, it’s a versatile acoustic – it feels as comfortable with blues fingerstyle as it does aggressive acoustic rock strumming. The D-16GT is ultimately a simple guitar, but one that shows great beauty in the design, build, playability and sound. You always know that dropping $1,500 on a Martin guitar is going to land you with a pretty great acoustic, and the D-16GT certainly delivers on this expectation. 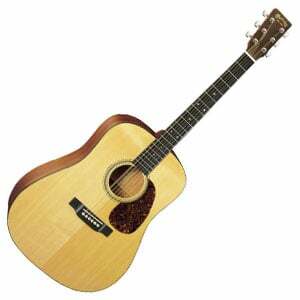 For more info about the Martin 16 Series D-16GT, click here.